Vitamin K-2 may play an important role in maintaining healthy levels of bone mineral density. Take 1 tablet orally 1 to 3 times daily preferably with meals or as directed by a healthcare professional. For best results, allow tablet to dissolve beneath the tongue and swallow. CONTAINS SOY . This product is manufactured and packaged in a facility which may also process milk, soy, wheat, egg, peanuts, tree nuts, fish and crustacean shellfish. KEEP OUT OF REACH OF CHILDREN. DO NOT USE IF SAFETY SEAL IS DAMAGED OR MISSING.STORE IN A COOL, DRY PLACE. Do not exceed recommended dose. Pregnant or nursing mothers, children under 18 years of age and individuals with a known medical condition should consult a health care professional before using this or any dietary supplement. 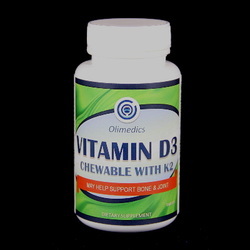 Active ingredients: Vitamin D-3, Vitamin K-2.